(Reports in order of most recent). The second round of the Soup and Toast series saw a choice of Pea & Ham or Pumpkin. The soup was commendably hot as well as highly nourishing. The accompanying bread rolls, soft and moist, were a welcome change to the palette after an earlier diet of Marlborough horse poo. The soup was enjoyed in splendid surroundings at the Dawkins farm shed. A couple of hours beforehand there had been a cycle race around the farm. That’s where the poo came in. And mud, lots of it, weighing down the bike and rendering each gearshift a lottery. 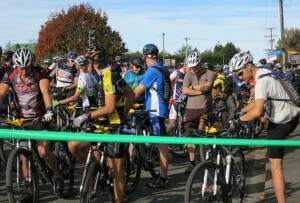 The course, while having 5% technical singletrack and 3 substantial climbs, was mostly a paddock race. Critical was picking the right line across what was often a swamp in disguise. The competitors had to complete as many laps of the 5km circuit as possible in 1 hour 30 minutes. Although a horrendously draining course, the process of becoming filthy was seriously enjoyable and big brown smiles were in high quantity as the soup was served. 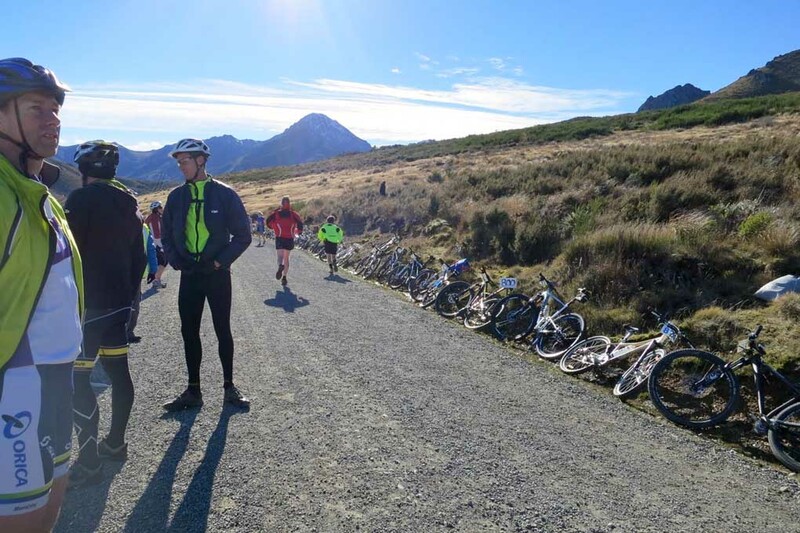 Thanks to the Dawkins family for letting us use their magnificent property and organisers Kevin Wilson, Peter Webster, Alana McLuckie and the rest of the Marlborough Mountain Bike club. Unfortunately I was in Auckland for Race #1 so cannot comment on the soup there. I’m sure it was equally souperb. (Oh dear). For the record, most competitors completed between 3 & 4 laps. I was the sole 5-lapper. The race was not serious but I still went full-tilt, apart from the first lap where some of us meandered about whilst trying to figure out where the course went. 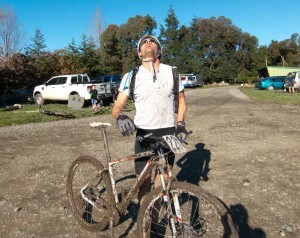 It reminded me of the Mt Somers race in April, apart from being a little less technical and a lot muddier. This was originally scheduled for early May and I was keen to do the solo 3 hour version instead of the 6 hour team. (I didn’t have the cajones for the 6 hour solo). However I heard that the course for the 3 hour was tres boring so went with the 6 hour team. However, due to atrocious conditions, the 6 hour team event was shortened to 4 hours and also moved to the 3 hour course. Confused? 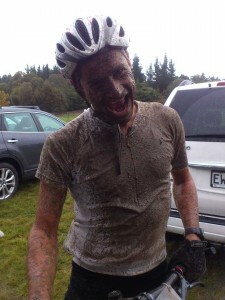 With the riders now all on the same waterlogged course it was always going to be interesting. I would start for our team and race the first 90 minutes. It was the filthiest conditions I’d ever ridden in. The riding glasses stayed on for 5 minutes and then were so covered in mud there was no way you could use them. The brake pads died a swift death. Nonetheless I had a good lead half way through the second lap. But then the drive train gave up the ghost and I nursed the bike to the transition where I doused it with fresh oil. I was then all good for the completion of my stint where our team had a handy advantage. I’m not sure where we actually came in the end. The event was cut short before the results and prizes were dished out, probably to save the entrants getting hypothermia. All-in-all a bit of an anti-climax. I started this race chilled to the bone, angry and high on adrenaline. At the finish line, only the anger remained. I’d teamed up with Tom Bryant for this one. As a mountain duathlon, Tom would run up the mountain with an altitude gain of 1000m. I would then bike down it. Fair arrangement I thought. After the race briefing, Tom and the other couple of hundred competitors set off. We drove to the saddle at Jacks Pass where we waited for the transition. Although sunny, it had apparently been snowing the day before and the alpine wind was indeed freezing. It’s difficult to warm up when you’re loitering around. I tried the odd star jump but ended up just staring up at the mountain watching for Tom to appear. Tom is a proponent of the ‘Training via Rest’ method so I figured it would be interesting to see the result of this type of preparation. He came into the transition mid-field, by which time I was rearing to go. He had obviously suffered, appearing pale and gasping something about chunder. He’d done well considering his running shoes had spent more time in South American night clubs than on the trails. But now it was my turn and I was determined to pass the competitors who had overhauled my ill-prepared teammate. A tail wind saw me flying beside the Clarence, with the landscape from my earlier Rainbow Rage agony flashing by. I was going 100%, passing others at a fair rate of knots. After a couple of short uphills a long rocky downhill ensued. It reminded me of the first Quartzopolis descent a couple of months earlier, with mango sized rocks strewn willy-nilly. And funnily enough it presented me with the same result – a puncture. I tried nursing the flat front tyre which seemed to be holding about 10 psi, keeping weight rearward where possible and praying the Stans puncture sealing solution would seal the wound. And it seemed to be, although I was watching it carefully and starting to slow as a result. Shortly thereafter, Stan decided to abandon me. 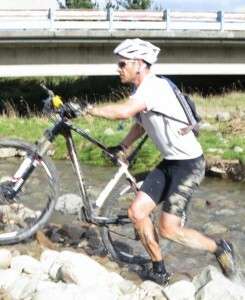 After another water crossing and a short climb it was time to admit defeat. I furiously dismounted, removed the wheel, pulled out my phone and texted my supporters the delay. There was no point hurrying with the change. My goal, to set the fastest bike time, had gone out the window. 14 minutes later I remounted and tried to summon myself for the final stretch to the end. And just like in the Quartzopolis I got another puncture, this time right on the last corner. Yep, I was a touch ropeable on the finish line. It turned out that the time difference between repairs was greater than the gap from the day’s fastest bike leg to my own. So I would have achieved my goal without punctures. But that’s mountain biking. There’s always the ‘Ifs’. The transition between run & ride. Since arriving in the South Island 5 months earlier I had been itching to get down to the Alps. So when I heard of this event I decided it was the perfect opportunity. A nasty sinus cold wasn’t going to get in the way. We stayed close by in Methven, and race day dawned crisp and clear. I had no idea what to expect of the course but was looking forward to some spectacular scenery and testing singletrack. There was a large field, I’d say a couple of hundred. The start was a little chaotic as the riders all jostled for position. After a couple of kms the course veered off the road and onto the event’s predominant surface: farm paddock. A rider in a ‘Push Bikes’ shirt was making some small attacks which I was working to pull back. Behind me, the rest of the leading group were riding in my slipstream. A brief cloggy uphill loomed and I veered left. The Push Bikes racer went right and I realised I’d taken the wrong line. I hammered to regain 2nd but there now existed a small gap which I never managed to close. A little later I got within a couple of seconds but the Push Biker seemed to extend it again effortlessly. As I struggled in vain to regain the leader I noticed not only that I was making no headway but my gap on 3rd was diminishing. About half way through the race was a mild clay-ey descent, very slippery. There were a few event photographers at this point hoping to catch a spectacular crash no doubt. And – what? Was that my wife amidst the photographers?! Next thing I knew I was off and 2nd place shot past. Just goes to show what can happen when you lose concentration I thought. I jumped back on, oblivious to the claret seeping from a muddy shin and regained the rider. There was no sign of 4th behind us as we now drafted each other along a flat gravel road. At a confusing junction my competitor went left. I yelled at him that he had taken a wrong turn. He had to about-turn and get back on my tail. This he did easily enough as we traversed yet another paddock. Way ahead I could see the Push Biker leading the field. I was feeling the pain and knew I’d be hard pressed to stave off my companion, let alone catch the leader. Ten minutes later we got to a critical point. I was following close behind my companion when a substantial river crossing came upon us. I slowed a few metres before the short descent to the river and observed his line. He chose poorly so I barrelled forward on a different path. As he remounted I shot past, and put my head down for the immediate ascent. By the time I crested I could hear him right behind me but I was suddenly feeling more encouraged and really threw caution on the loose double track descent. It was long and when I reached the bottom I knew I had put distance between us. With the race about 80% through I knew this was the time to give it death. I raced through a waist high plantation of some unknown crop and kept the pace up along the long flat stretches. I didn’t look back as I tucked my elbows in and tried to go as aerodynamic as possible. Ten minutes later there was yet another stream crossing. At this point I really did see my wife – “You’re coming fourth!” she yelled as I dismounted for the unrideable crossing. Fourth?? That’s not right. She’s mistaken I thought, before disregarding the notion to remount and focus on another punishing fire road climb. I got to the top breathless and glanced right. I could see him then. He was a few hundred metres back and I knew I had him if I could just hold on a little longer. It can’t be much further I thought, anxiously looking for familiar scenery. And sure enough there it was – Mt Somers township and the finishing chute. I was elated to have come second especially with gunked up sinuses. At the half way mark I felt almost certain I was going to be third at best. I had dug deep. There was a lot of confusion post-race. The winner was in no doubt – Logan Horn, the Push Biker, was the strongest in the field. But apparently two riders had taken the wrong turn at the junction where my companion also almost went the wrong way. This presented the organisers with some headaches but it all got cleared up in the wash. Results at the event website. 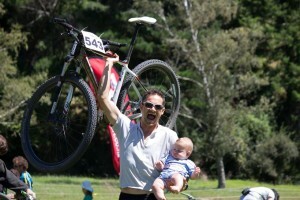 The Mt Somers Bike Race is an excellent occasion. The local Lions club do a grand job of organising with proceeds benefiting the community. Unfortunately the great singletrack and magnificent scenery I expected never materialised. There just isn’t any singletrack and spectacular scenery was the last thing on my mind on this day. “I think it’s less than 3 hours from Blenheim to Reefton”. That’s what I told my companions the night before the Quartzopolis, a 35km “historic adventure” mountain bike race in Reefton. 12 hours later, 9:30am race day, and I was in my sports car pushing the traction boundaries around the Buller gorge. 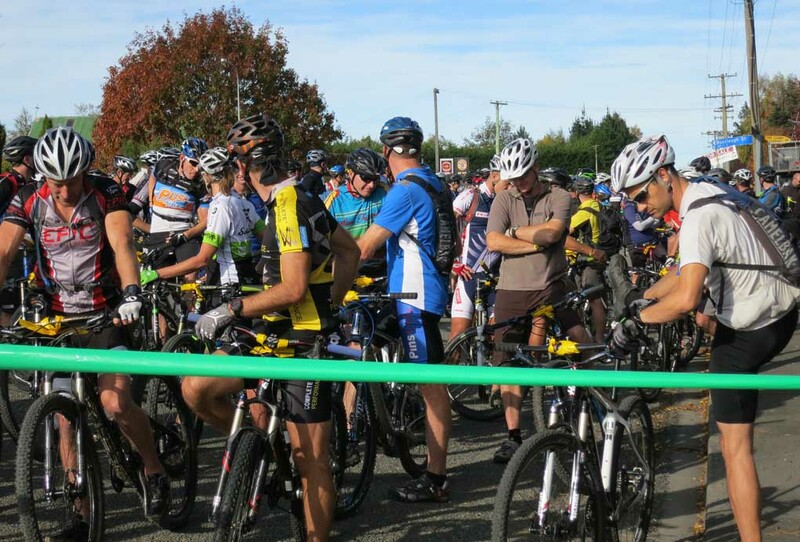 With the race due to start in half an hour, the Aucklander had once again misjudged South Island driving distances. Nevertheless, I arrived at the 11th hour, with time to note the abundance of serious looking competitors warming up. (The muscular legs and sponsored bike-shop clothing is always a giveaway). Off went the gun and the racers rode along a sealed road for roughly 5 km. A rider in bright orange Cycleways attire shot off from the leading group. I didn’t know at the time, but this was one of NZ’s fastest mountain bikers – not just a guy having a light-hearted blast. There were other Cycleways riders alongside me, and as the road narrowed into gravel doubletrack I found myself in a chasing group of 5. Towards the top of a long road the track narrowed further and myself and another Cycleways rider had pulled away on our own. He was setting a fast pace and I was hard pushed to keep up. Perhaps trying to haul back his companion, I thought. As the track got rougher I found myself feeling much better. I was now completely warmed up (the panic pre-race not allowing me to loosen my muscles at all before the start). I pulled away from second place and found myself alone on a long rocky descent. It was seriously rough stuff, the type of small boulders that destroy bikes and bodies. About 5 minutes later, and I was ascending again. Anxiously though – an occasional knock from the rear wheel hinted at a loss of tyre pressure. I kept riding, feeling strong (the Rainbow Rage the previous weekend had prepared me well) but increasingly worried. And sure enough, all of a sudden, all the air went out of the tyre. I was appalled – I had been coming second in a strong field and feeling great. The Stans No-Tubes solution was unable to seal the puncture. The riders flashed by me (some offering condolences) as I lethargically inserted an inner tube. It took me ages to change the tube, and with rain starting to fall, I remounted and tried to summon my motivation. The track became rougher, now highly technical singletrack. Mud and wet off-camber tree roots were plentiful. About 10 km before the end I got a second puncture. I only carry one spare tube on a race, so a wet and miserable 20 minute walk ensued. Without cell coverage I could not text the delay to my family (including my parents from Auckland) who were waiting at the finish. After a while my faith in humanity was bolstered as a rider came to my rescue and gave me his spare tube. Many thanks, Guy. I cruised home mid-field, soaking wet and cursing mountain biking, the Quartzopolis, and all things related. The race was won by the Cycleways guy who rode out from the field at the start. You can check out Brad Hudson’s take on the race here. (I doubt I would have caught him). An excellent, roughly 5 km loop on Picton’s ‘Snout’. The trails demanded constant concentration with the temptation to peek at views of the Marlborough Sounds posing the chief danger. While not a huge entrant list, I was happy with my ride (1st). Big thanks to Bike Fit Marlborough for supporting the local club champs. Entering the Coppermine was a last minute decision which turned out to be a good one. I had only just got back into training after being distracted by things like fatherhood, and having never ridden in Nelson I wanted to see what all the talk was about. The vaunted Dun Mountain trails were, at least in the second half, sensational. Technically demanding mountain biking at its best. And the competition from Nelson was tough; I found myself engaged in a major battle. After a starting loop around the paddock to stretch out the field, the racers started up a long fire road climb. The lead group thinned to 3 and I found myself alongside two Richmond AvantiPlus racers. The longer Epic course riders had started 10 minutes earlier so the 3 of us had to negotiate our way past backmarkers on narrow off-camber straights. Being third in the group the risk was that the AvantiPlusers would get past an Epic participant on a short passing spot and I would be stranded waiting for the next passing opportunity. A little bustling on my behalf and staying very close to the wheel in front helped me stay in touch. The course took a turn and traversed the hillside on a shady rail trail. At about this point one of the AvantiPlusers dropped back, never to be seen again. So it was now just the two of us, and not long after I managed to open up a gap. The gloomy rail trail burst out into the bright summer sun and behold, I was upon the mineral belt and its strange collection of bronze and green rocks. Ahead loomed the highest point and behind the AvantiPluser had closed the gap and threatened once again. Over the Coppermine saddle and into the Boulder Valley downhill, a descent like no other. There is a great video of this trail on the event homepage. The faster you went, the more fun you had. I could now see why the event briefing had such a focus on rider safety. If you came off here you’d be shredded. My opponent was breathing down my back and once even tried to convince me to do the gentlemanly thing and let him past. I thought I was riding pretty smoothly but it was his home trails after all. Finally the rocky switchbacks came to an end and I had to almost manually unclench my fingers from the brake levers. Into the Maitai Valley and the pace was fast on the weaving singletrack. We exchanged leads a few more times until, at the 2 hour mark, we encountered terrain from the race’s very beginning. I expected to be racing for at least 2 & 1/2 hours so I reasoned that there would be another loop before the end. “But what if there’s not?” I asked myself. My shadow was still breathing down my neck, and the last thing I wanted was for him to sprint me at the finish line while I was expecting another 30 minutes of racing. My legs amazingly still had some gas in them so I picked up the pace on the narrow undulating singletrack we’d ridden 2 hours earlier. This is the end, I thought between the gasping. We were heading directly back into the starting paddock; we were only minutes away from completing the 40km Coppermine Trail. It’s now or never I thought. The AvantiPluser was only metres behind me and so with about 500 metres left I gave it everything. The track was still too narrow for him to pass but for the final 200m on the paddock there was every opportunity. It looked like being a sprint finish and so it was. With 100m to go and the early afternoon sun at our backs, I remember glimpsing his shadow from the corner of my eye. I had the inside line at the final corner and with 50m left my legs had enough in them to hold him off. I couldn’t believe I had won. I had taken 2.06:36 and local Jonny Christie came in two seconds back. My only regret was that my support wasn’t there to see the sprint finish. (I’d told them to go shopping in Nelson; I’d be close on 3 hours). Looking back, the Coppermine was the best organised event of the season. There was a festive feel, massages, a river to dunk in, smoked kahawai, cold beer and good sounds. What more can one ask for?